While that survey didn’t ask people why they supported or opposed the death penalty, a 2011 survey (which found 62% support for capital punishment), did. Roughly half (53%) of supporters said death was the appropriate punishment for murder; as one respondent put it, “You kill someone, you get the same deal.” 15% of supporters cited the cost of keeping prisoners locked up for life (or, as one respondent said, “If you took a life you should lose your life rather than the people having to pay for you to watch TV and sit around in jail”). 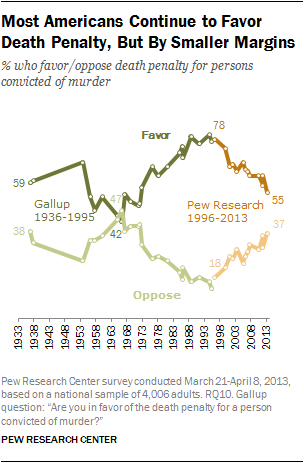 Only 6% of death-penalty supporters cited a deterrent effect. Among opponents, the leading reasons for not supporting the death penalty (27% each) were that it’s morally wrong and that an innocent person could be executed by mistake. That latter reason, up from 11% two decades earlier, likely reflects publicity about exonerated death-row prisoners: Since 1989, according to the National Registry of Exonerations, 106 people convicted and sentenced to death have been later exonerated. A new study of exonerations in the Proceedings of the National Academy of Sciences concluded that if all death-row prisoners remained under sentence of death indefinitely, at least 4.1% would eventually be exonerated. Few in the 2011 survey cited concerns about the mechanics of executing condemned prisoners. Since then, however, the sole American manufacturer of sodium thiopental — a sedative that typically has been the first drug in the three-drug protocol used by most states for their lethal injections — has stopped making it, and the European Union has banned its export to the U.S. for use in executions. That’s significant because the vast majority of U.S. executions are conducted by lethal injection — 87% of all 1,378 executions since the death penalty was re-established in the 1970s, and all but eight of the 493 executions in the past decade. Hence, many states have been forced to devise new ways of executing prisoners. Lockett’s bungled execution, in fact, was Oklahoma’s first tryout of a new protocol that used midazolam instead of sodium thiopental as the first drug, intended to render the condemned prisoner unconscious. But according to news reports, Lockett began writhing and gasping on the gurney after he had been declared unconscious and the other drugs (intended to paralyze his breathing muscles and stop his heart) were being administered. Prison officials halted the execution; Lockett then died of a heart attack. A second execution scheduled to follow Lockett’s was postponed.